There Can Only Be One...Extremely Long Hearthstone Turn. Update: Mamytwink's turn has finally come to an end at an astonishing 45 hours, or 45 hours and 18 minutes to be precise. You can watch the entire turn on Mamytwink's Twitch page, if watching 45 hours of the same shining, sparkling, repetitive Hearthstone attack floats your boat. How long was your longest Hearthstone turn? A minute or two? Bet it wasn't seven hours (and counting). Well, that's what Hearthstone player Mamytwink is up to in his current attempt to take the longest turn that the game has ever seen. That's seven hours on an estimated 43 hour run, by the way. 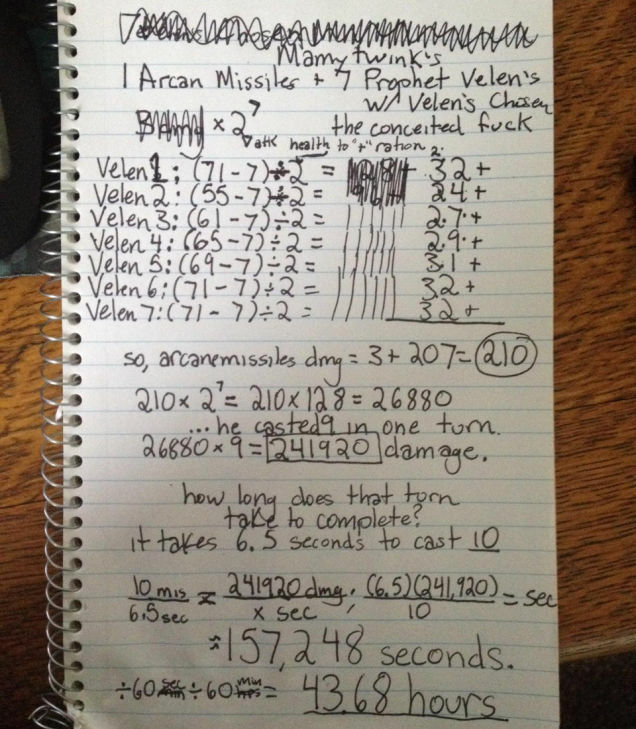 Mamytwink's plan is as follows: Use seven Prophet Velens (in addition to a cocktail of other cards) to blast his opponent to smithereens by doubling his mage's arcane missiles. Thanks to this combination and the event that began the entire reaction (nine arcane missile cards used in one turn), he has a whopping 28,752 missiles in his arsenal, totaling at 258,768 points in damage. Take a look below at the staggering mathematics involved below. So how is his opponent still standing? Well, by using Ice Block, of course. Ice Block essentially freezes the player's health when that player is faced with an attack that would cause fatal damage. The next question is why is Mamytwink even bothering to do this? I'm sure we know the answer is, like in all things, because he can. As of writing this, Mamytwink has left the game and stream running, but is not currently active on Twitch. All I have to say is Go, Mamytwink, Go!